If you have more than one child you may understand this tale: I have two children. One is an adventurous eater, and one is not. One loves fish, and the other can’t stand it (although I don’t really remember her tasting much of it.) One loves butter, while the other would prefer not to be seated at the same table with it. My highly unscientific theory is that this is nature’s way of ensuring that it’s offspring do not starve. If siblings have opposite tastes, then there is enough sustenance to feed the litter. After all, how would our species advance? At least this is how I console myself as a parent and a cook. Which brings me to brussels sprouts. OK, I understand that you don’t have to be a child genetically predisposed to preserving the human race to dislike brussels sprouts. These little crucifers are enough to rile many a mature adult. But in our home, they are enjoyed – at least by most of us. My son likes them, and, therefore, my daughter does not. So, in a moment of inspiration and indefatigable hope I purchased a bag of firm pretty brussels sprouts at the market today with a plan. Instead of stir-frying or steaming them, I would gratinée them. While my daughter dislikes brussels sprouts, she loves gratins. Anything cheesy, creamy and crispy is right up her alley. Why not? I would give it a try. And you know what? She liked it. The problem is that my son, who dislikes rich and creamy food, did not. Preheat the oven to 350 F. (180 C.) Wash brussels sprouts. Trim outer leaves and bottoms, then cut in half. Steam brussels sprouts until crisp tender, about 3 minutes. Transfer to a large bowl. Melt the butter over medium heat in a saucepan. Add the garlic and saute until fragrant, about 30 seconds. Add the flour and stir with a wooden spoon until well combined and light golden in color. Add the milk in a steady stream, whisking to incorporate, and bring to a boil. Reduce heat and simmer, stirring, until thickened. Stir in the Gruyere cheese, salt, pepper and nutmeg until smooth. Pour over the brussel sprouts and stir to thoroughly coat. Transfer to a gratin dish. Combine panko and Parmigiano in another small bowl. Sprinkle evenly over the brussels sprouts. Bake in oven until golden brown and heated through. That definitely looks and sounds marvelous! I am a sucker for Brussel sprouts. LOL. I love the story. That sounds about how it goes in our house most of the time too. As for the brussel sprouts…I’m one of those adults that still can’t stand them. However, I do like the idea of using them in a gratin – like your daughter, it might get me to eat them. Further proof that parents just can’t win. I love this recipe. I am in the minority on this but love Brussels sprouts. You have my sympathy — and empathy. Been there. Bu no one liked Brussels sprouts, except me. So I am delighted that my “Screaming Heads” — a creamy version like yours — is my Thanksgiving contribution for the big gathering. While this, among many of your other posts, is going into my recipe file, I really want to know where you got that dish! I love it. I spent yesterday working on a butternut squash gratin in 90 degree weather – great minds think alike, I guess…I can definitely see this on the table for our next cooler weather dinner party. Looks delicious! Love the gruyere and the gratin in general! Thanks. I have heard that if you score an “X” into the bottom of the sprout (where it attached to the stem) it becomes less bitter. Not withstanding, cheese on anything makes it delicious! Too funny our two also have quite different tastes. Maybe it is universal. I will say, however, that often find brussel sprouts a little strong though a local chef has risen to the challenge of finding preparations that I can muster. I have become a bit of a Brussels sprout fan recently, but having said that the addition of cheese and breadcrumbs to the mix = ultimate taste sensation. Even for those who dislike the sprouts! I adore brussel sprouts! This looks like a phenomenal dish… add gruyère to anything and count me in! I didnt see this recipe earlier. A really lovely way to have brussel sprouts I’d like to have crispy pancetta with that just to make it even more fatty! I’ve learned to love brussel sprouts over the years and I think I could definitely enjoy this recipe at least once a month…though I might toss in a little bacon. Great recipe! Loved this recipe! Picked perfect brussels in my garden – now tinged with the first frost there is no bitterness. The creamy gratin enhanced the natural flavor. Thank you! 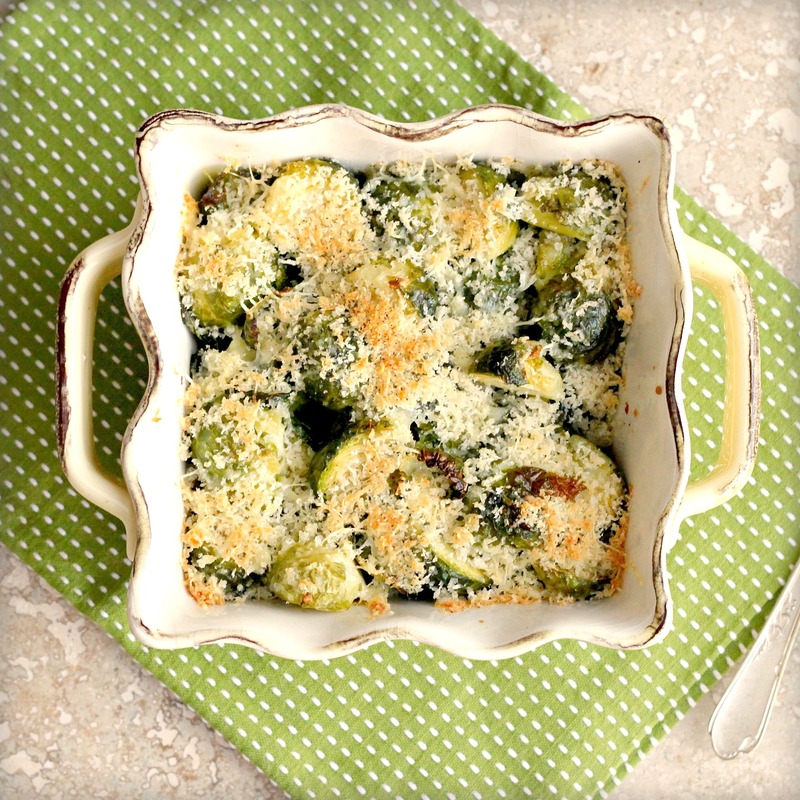 Well, I love both brussel sprouts and gratins, so this sounds wonderful. My two kids fit a similar pattern, while neither is necessarily picky, the favor different dishes. This dish is definitely worth a try.